Channelizers are traffic safety products used to alert and direct traffic through roadwork or away from hazardous areas. They are often the orange plastic molded products that you see lined with reflective sheeting. Plastic channelizers are weighed down by a rubber base, varying in shape, size and function. Different channelizers are often used state to state, based on specific regulations. Additionally, all channelizing products are required to meet the guidelines of the Federal Highway Administration. In the event of roadwork being done in a high-speed area, you will usually see channelizer drums between the worksite and motorist activity. The size of these drums allows for the largest amount of reflective sheeting, making them easily visible to drivers maneuvering through the area. The flexibility of the drums allows them to easily snap back into shape when they take on any damage. Vertical panels are used in a similar manner as barrels, but are seen more often when traffic is divided, when there is limited room, or when state guidelines specifically call for them. They have become increasingly popular as an alternative to the larger channelizing drums since they are cheaper and easier to transport and store. Delineators are another type of channelizer used to guide vehicles through roadwork or hazardous areas. The tall slim design of delineators allows them to be effectively used between lanes of guided traffic, and easily stored. 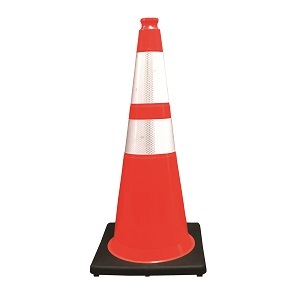 Cones are more often used to channelize traffic in slower moving areas, or alongside smaller roadside projects. 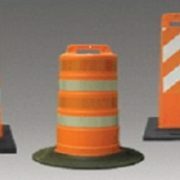 Generally cones come available in three sizes: 18 inches high, 28 inches or 36 inches and may sometimes include a handle at the top that makes placing and removing them from the roadway easy. While channelizers are used to direct traffic, barriers and barricades are used more to restrict it. Barriers are large, heavy, wall-like structures that are used to physically protect workers from traffic. The purpose of barricades is not to directly protect workers, but to alert drivers. On the road, Type I and Type II barricades are used in work zones while Type III barricades mark closings. Although the types and uses of channelizers differs slightly between states, they all serve to alert traffic and protect drivers and workers.